Garry Robison was born in Yorkshire and joined the Royal Marines in September 1976. As a junior officer he held a variety of command appointments in 45 Commando Group, Comacchio Company, CTCRM, and the Royal Marines Air Defence Troop, and qualified as a Physical Training and Sports Officer serving at the Britannia Royal Naval College Dartmouth. He undertook operational Emergency Tours in Northern Ireland in 1977 and 1978, and conducted environmental training in Norway, Western Europe and the Mediterranean. He commanded a Rifle Company in 40 Commando Royal Marines before attending the Army Command and Staff College at Camberley in 1990. Staff appointments have included Adjutant of Royal Marines Poole, Chief of Staff of the Logistic Support Group within the United Kingdom Mobile Force, as an MOD staff officer in both the Directorate of Operational Requirements (Sea) and the Directorate of Military Operations. He was the Royal Marines member of the Directing Staff at both the Army Staff College, Camberley, and the Joint Services Command and Staff College, Bracknell on its formation in 1997. He completed an MPhil in International Relations at the University of Cambridge before assuming command of 45 Commando Royal Marines in July 1999. 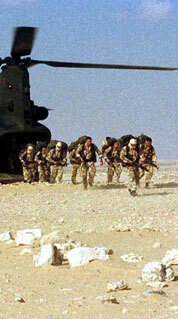 During command, the Unit undertook environmental training in Belize and an operational tour as the Pristina Battlegroup in Kosovo in 2000. Following a further tour in MOD as an Assistant Director within the Equipment Capability area, he attended the Higher Command and Staff Course in 2003 and then deployed to Iraq for 6 months as the Deputy Commander of the Iraq Survey Group. 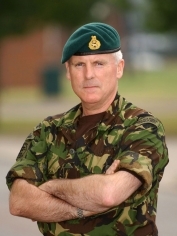 In April 2004 he was appointed Commandant of the Commando Training Centre Royal Marines where he served for 2 years. Promoted to Major General in June 2006 he assumed his current appointment as Commandant General Royal Marines and was also the Commander of the UK’s Amphibious Forces between June 2006 and May 2008. During this latter appointment he served for 12 months as the Deputy Commander Stability within HQ ISAF in Kabul, and was also the Senior British Military Representative – Afghanistan between February and December 2007. He is married to Bridget and they have three grown up children (a son and two daughters). He has represented the Royal Navy and Royal Marines at cricket, remains a keen footballer, and is President of both Royal Navy and Royal Marines Cricket, President of Royal Marines Football and Vice President of Royal Navy Football.